When you are trying to create a gift certificate with a design that is simple but still a little bit fun, you will find that this gift certificate template word will help you with that. This template has a look to it that is serious with a little fun added in. This blue certificate is something that will draw attention because of the large bow that is featured on it, but it is something that is simple enough that everyone who sees it will be able to read it and understand it. Those who use this certificate will be able to fill in the name of the one who will be receiving the gift as well as the name of the one who is giving the gift. This can be changed up to make it work out for your business. 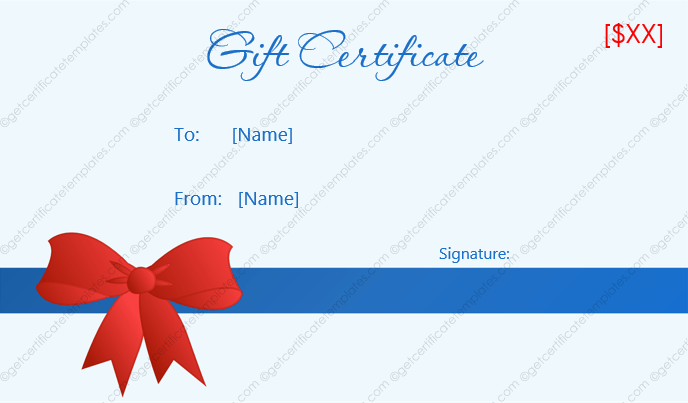 You can use this gift certificate template word to help bring in new customers.